Let’s face it, a delayed flight can be enough of a nightmare for the average traveler going on vacation with their family. However, if you’re flying out to a business meeting, or running a small company by yourself, then those delays can be more hassle than you can possibly imagine. The good news is that you can make the most of the extra time that a flight delay dumps in your lap. 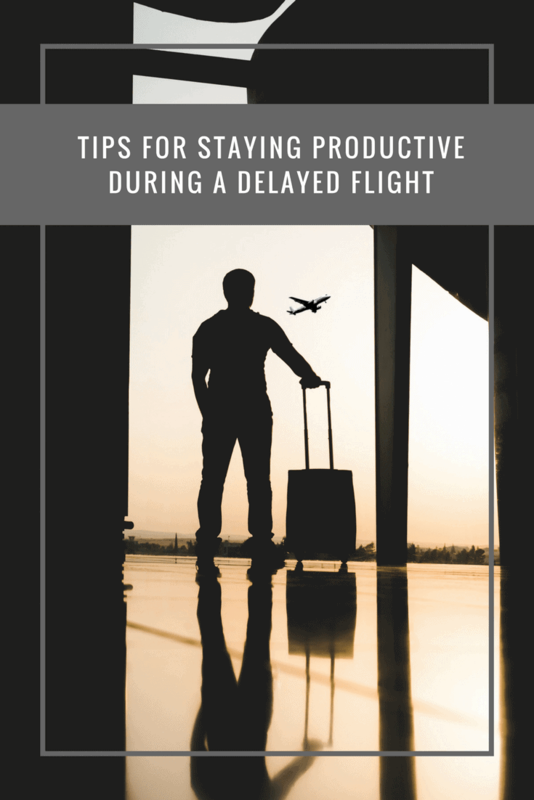 While you don’t have to give up on getting compensation for your missed flight, while you’re waiting to be moved onto an alternative aircraft, there are plenty of things you can do to get things done and stay productive. Even if your flight isn’t going to take off on time, you won’t get much done if you’re spending hours checking in and tracking down the gate that you’re supposed to be leaving from. There are ways to make your check-in process easier and more straight-forward today, by signing up for airline apps and downloading boarding passes to your phone or tablet. The chances are you’re going to need two important things if you want to be productive during your flight delay. The first thing is going to be personal Wi-Fi that allows you to access the internet in a hurry, and the second thing will be a charger that keeps your devices up and running when you’ve got a lot of work to do. If you can’t find a Wi-Fi connection or even a plug-in space for your charger, you can always ask an agent for help. The chances are that there are a lot of important things that you need to get done on your business trip. Even if you’re working on the fly, you’ll need to have your goals in mind to improve your chances of accomplishing things as quickly and effectively as possible. When your flight is delayed, write a list of things that you’d like to accomplish during the delay time. At the same time, think about what you’re going to need to do on your upcoming trip. For instance, if you’re meeting with a client now might be the perfect time to start researching them and their company. If you have your smartphone with you on your journey, which you probably do in this day and age, then there are plenty of apps that you can download to make it easier for you to get things done during your delay. For example, you might need to figure out exactly how you’re going to log your expenses in the time that you’re away. An app could help you keep track of what you spend over the course of a weekend or an entire week, so that you can offer a complete insight into what you spent and why to your boss, or accountant. If you’ve been meaning to speak with a few important customers for a while now, but you haven’t had a chance to send out those important emails, then what better time to get started than when you’re stuck in an airport with nothing else to do? Flight delays aren’t great for anyone, but they can be a fantastic opportunity to do some of those tasks that you’ve been putting off lately. If you owe someone an email or a conversation, take the time to get things sorted instead of stressing over the status of your flight. No matter what kind of business you run, it’s safe to say that industries are constantly changing. There are plenty of opportunities to catch up on the news in your sector while your waiting for your flight to be re-scheduled. With that in mind, educate yourself and think about how you might be able to take advantage of new trends or opportunities in your area. You could also catch up on stories that you want to share with the client that you’re meeting. Finally, being productive when you’re delayed on a business flight isn’t always about getting things done or going through a to-do list. Sometimes, you really just need a little time for rest and relaxation before you jump back into the business world. If you know you’re going to be rushed off your feet from the moment you arrive in your chosen destination, use your delay to take a quick nap, eat some healthy food, and give your mind a break.